So it's Monday yet again! Hopefully you all had great weekends! Today I have a bright and fun mani to share with you all. I don't really feel like elaborating too much so I am just gonna get down to the pics! What you are looking at is Nerdlacquer Shiny topped with HITS Hefesto, which is kind of like a holo top coat so you can give that pretty holographic shine to any color. It's awesome! 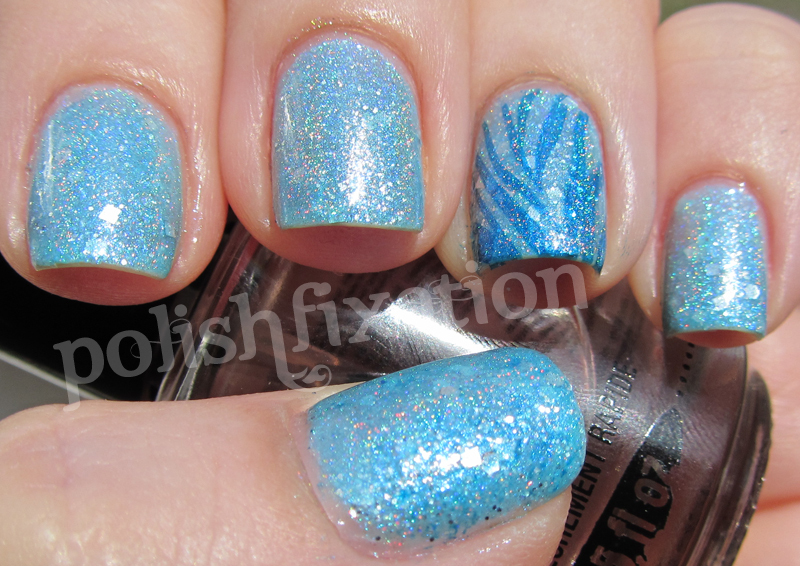 I also stamped the accent nail using the blue pearl Konad Special Polish with an image from my DRK-A stamping plate. I loved wearing this mani and it held up really nicely for about 5 days! Gorgeous! I can't believe that Shiny is sitting in my untrieds! Gorgeous combo, and I love the accent.